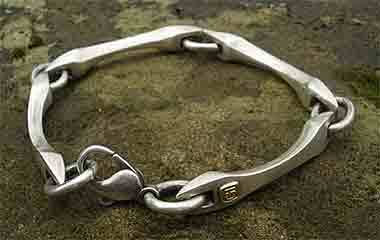 MEN'S DESIGNER BRACELETS : BRITISH Made : LOVE2HAVE in the UK! The Best! 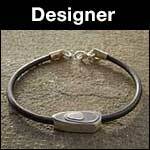 British men's designer bracelets all with designer style and handmade in the UK at prices you can afford. All pieces are fully guaranteed, and returns are accepted. Men's bracelets and bangles are fast becoming one of our most popular lines of men's jewellery. Although men have often worn rings in the past, other jewellery hasn't been quite so popular and if worn, would have been small and discreet. Gold is no longer attractive for this type of jewellery, and although this in part is due to the high cost, we believe it is also because of the colour. A chunky gold chain bracelet would now easily set you back a four-figure sum, and that is beyond most people's budget, so we are therefore currently seeing significant interest in chunky styles of silver bangles and bracelets. 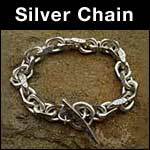 Men seem to prefer silver because of the weight and will often opt for the heavy chain style bracelets or the chunky torq style bangles. Although identity bracelets are not so popular these days, we do find that our chunky chain ID bracelets appeal to many men, and we can offer different weights, link styles and sizes not easily located on the high street. Silver looks good with casual or formal wear and offers the option of many finishes such as hammered, polished, satin or the very popular oxidised which can look very urban or dare we say Gothic. 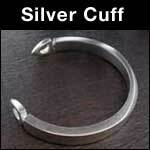 We offer a range of men's silver bracelets and bangles all made here in the UK, and all made to your size if required. If you let us know your wrist measurement, our designers will make it to your correct size. We can also personalise many of our men's bracelets with a laser engraving from a simple message or a date to logos or complicated patterns.